This is the pavilion at the top of Mount Austin Road in Hong Kong. The pavilion offers welcoming shelter to visitors looking to enjoy the views of Kowloon and the nearby islands. Situated on the site of the former Governor of Hong Kong's summer house, known as Mountain Lodge, this area is a much less touristy way to enjoy some truly spectacular views of the island and city. 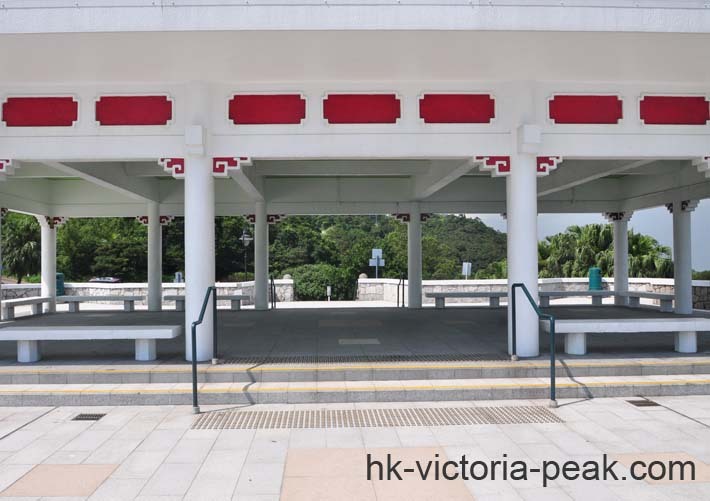 Picnics and enjoying being outdoors are, not unsurprisingly, a very popular pastime in Hong Kong and situated right next to Mountain Lodge is Victoria Peak Gardens. The gardens are a series of manicured grass lawns that are connected by stone steps and surrounded by various hiking trails like the Governor's Walk, which takes about 30 minutes to complete and the Morning Trail, a 2,800m long paved trail that is a great walk around Mount Victoria. Other great things to do from here might include a wandering around Gate Lodge, which was the living quarters of the keeper of Mountain Lodge before it was demolished or walking to the peak, which would only take between 5 and 10 minutes from here.